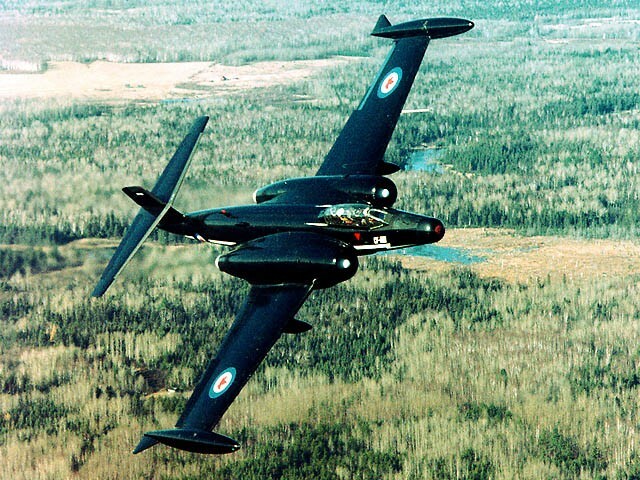 CF-100 #100785 made its last flight on February 10, 1982 painted black to resemble the prototype CF-100, #18101. CF-100 #100785 is on loan from the Canada Aviation and Space Museum in Ottawa, Ontario. 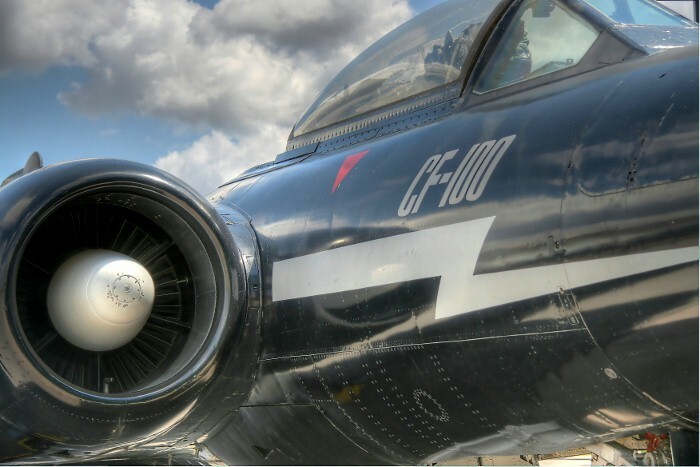 The CF-100 Canuck was the first fighter aircraft to be designed and built in large quantities in Canada. Avro Canada started development in 1946 in response to an RCAF requirement for a two seat, all weather fighter. The CF-100 first flew from Malton (Toronto) in January 1950. Although not quite as fast as smaller contemporary fighters, its excellent climb, fine radar and fire control systems, twin engine reliability and all weather capability made the CF-100 probably the best all weather fighter of its time. It entered RCAF service with No. 3 OTU, North Bay, in July 1952 and at its peak equipped nine interceptor squadrons across Canada. In 1956, a further four squadrons were moved to Europe to serve with NATO. The CF-100’s main role was interception of Soviet bombers that penetrated Canadian and Western European airspace. Early versions were armed with machine guns, while later versions were equipped with rockets. When retired from their fighter role some aircraft were fitted with electronic countermeasures (ECM) equipment. It was intended originally that the CF-100 should be replaced with the Avro Canada CF-105 Arrow, but this project was cancelled in 1959. The CF-100 was replaced eventually as an interceptor by the McDonnell CF-101 Voodoo in 1962. The Canadian Forces continued to operate the CF-100 until December 1981, when it was finally phased out. A total of 692 CF-100s, spread over five marks, were produced between 1950 and 1958. 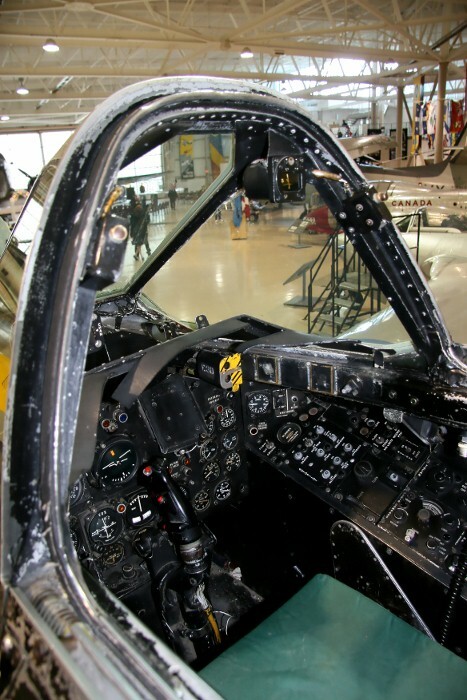 The CF-100 on display at the Museum was manufactured in 1958 as a Mk. 5 and was one of the last batch produced. Built as an all weather interceptor, it was later converted into a Mk. 5D electronic counter measures (ECM) aircraft and used for the realistic simulation of enemy aircraft during NORAD exercises. The aircraft is fitted with wingtip fuel tanks instead of rocket pods to extend its range for ECM duties. It served in an electronic warfare role with 414 "Black Knight" Squadron in North Bay, Ontario until December 1981. 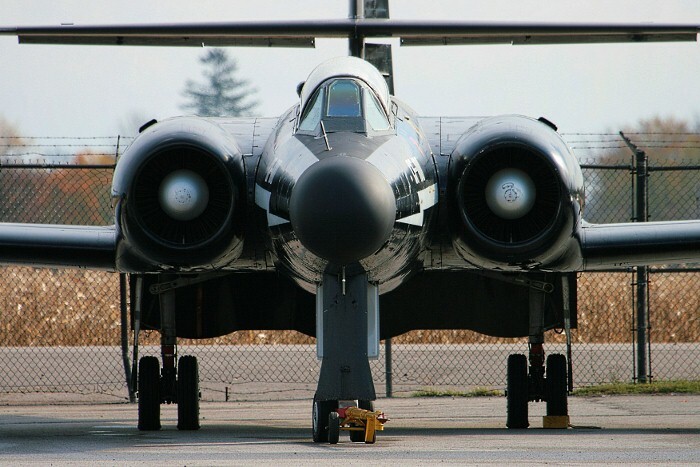 It made its last flight on February 10, 1982, when it was delivered to the Canada Aviation and Space Museum in Ottawa. 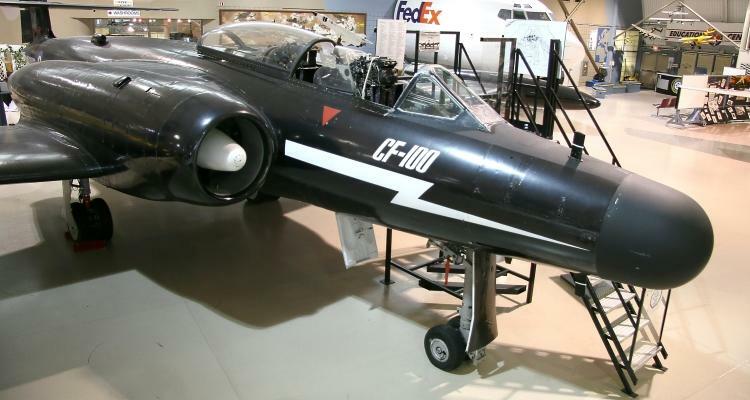 It is now painted black to resemble the prototype CF-100, #18101, and is on extended loan from the Canada Aviation and Space Museum.